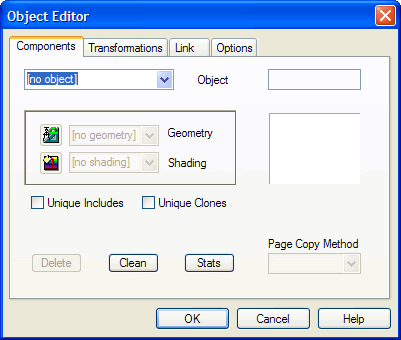 The Object Editor dialog box contains an advanced set of options for controlling an object’s appearance, positioning, hyperlinking, resolution, copy options, and target output. If you are unsure why an object is appearing or behaving in a particular way, check the settings on the Object Editor dialog box. The most commonly used options for editing objects are available on the Quick Properties Editor dialog box. For more information, see Quick Properties Editor Dialog Box . Control an object’s appearance, positioning, hyperlinking, and other elements using the Object Editor dialog box. Double-click a shape, drawing, or image object in the Work Window, or click a shape, drawing, or image object and press Enter. With an object selected, click the Object Editor button on the Object Bar, select Object>Object Editor, or press ALT+O. The Object Editor dialog box associated with the selected object will open. With no object selected, click the Object Editor button on the Object Bar, select Object>Object Editor, or press ALT+O. From the Object Selection drop-down menu on the Components Tab you may then select any object in the project to edit.